“There is no better place to test out these ideas out than in Photoshop. This way I could trial ideas of secret spaces without having to deal with the problems of physically altering space” - Jennifer Mason. 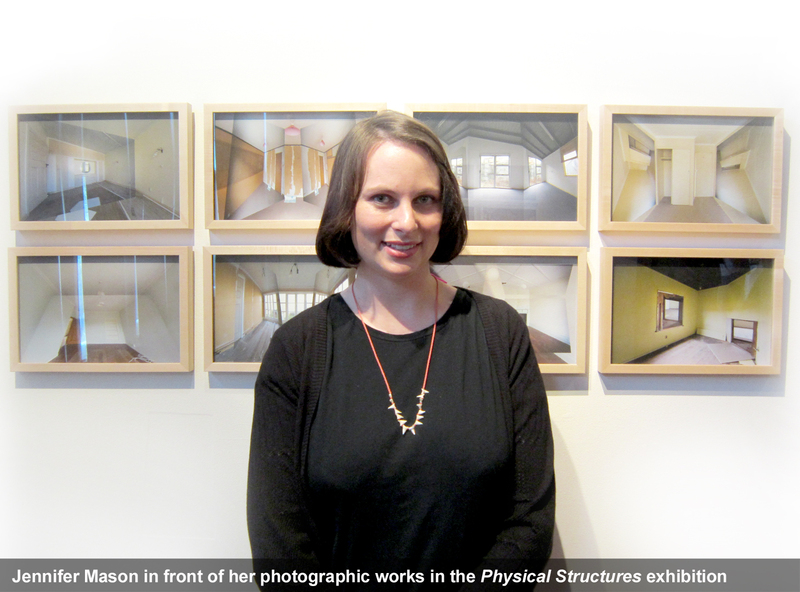 Physical Structures features Jennifer Mason’s digitally altered interiors of houses found in removal yards. Her Photoshop manipulation of scale and perspective transforms these vacant relics of suburbia into puzzling arrangements of space and geometry. These digitally renovated rooms disorientate our sense of what is real and familiar. Mason manages to create patterns and spaces in places that do not exist in the original rooms, by repositioning architectural elements in a given room she constructs secret rooms and hidden dimensions. “There is no better place to test out these ideas out than in Photoshop. This way I could trial ideas of secret spaces without having to deal with the problems of physically altering space” - Jennifer Mason. The use of Photoshop is obvious, Mason does not cover up the architectural makeover she has instigated and this is unlike the graphic programme’s usual application that often retouches illusion to appear ‘real’ in seamless ways. Mason likens this approach to the Modernist painters who did not hide the material qualities of paint. Looking at these photographic works is like seeing into a kaleidoscope, turning the world into a jumble of shapes and patterns. This ‘cutting and pasting’ of multiple angles ties back to the Cubist art movement showing that there is more than one way of seeing at one time. 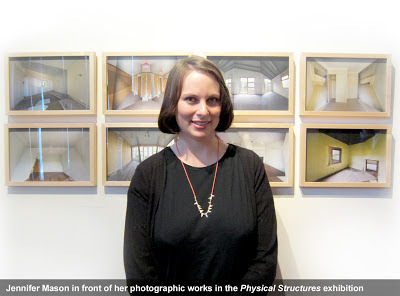 Mason creates a kind of alternate reality by transforming three-dimensional spaces into two-dimensional images and again into multi-dimensional Physical Structures. Jennifer Mason is an Auckland-based artist that is currently completing a Post Graduate Diploma in Fine Art at Elam. Recent exhibitions include St Paul St Gallery, ProjectSpace B431 and Pah Homestead; and art projects include the Te Tuhi Billboard project, Bledisloe Walkway Light Boxes: An Auckland Council Public Art Project. In 2012 she has been a finalist in both the 19th Annual Wallace Art Awards, 2012 National Contemporary Award and is the winner of the Walker and Hall Waiheke Art Award. Mason’s work can be found in the Wallace Arts Trust collection.